The character of Caroline Bingley has been redeemed in this highly readable, if somewhat fanciful, Austen continuation. The Other Mr. Darcy imagines a scenario in which an American cousin of Mr. Darcy, Mr. Robert Darcy, happens to visit and witnesses Caroline crying over the loss of her marriage prospects. Although this description may sound like the ingredients of a cheesy romance novel, the character of Miss Bingley is thoroughly explored and she satisfyingly evolves from Elizabeth Bennet’s adversary in the original to a relatable protagonist in her own eventful tale. Robert Darcy is stuck in England while he awaits safe passage to the states, and spends this time escorting Caroline and her sister to Pemberley, where Elizabeth Darcy has been convalescing and had requested her favorite sister’s presence. As the Bingley household moves to Derbyshire, Caroline finds herself in a precarious social situation and is summarily rescued by Robert Darcy–though grudgingly on her part. Misunderstandings and covert courtships ensue, all the while shaping Caroline from a prim-and-proper etiquette enthusiast to a more likable, open-minded heroine. Full of atmospheric details, the story describes the customs surrounding Caroline’s level of society deftly, which gives an eye-opening background to her character that Jane Austen never covered. While Austen purists may pick apart the loose plot (American cousin suddenly materializing, Caroline’s deviation from her original character, and an event mid-story that is never resolved), others will find an easy, enjoyable read that highlights and improves one of Austen’s superficial antagonists. 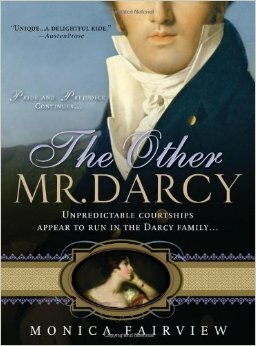 I found The Other Mr. Darcy to be a refreshing and diverting spin on Pride & Prejudice, even if a bit far-fetched.